Yes, Christmas cheer is starting to build. We are all getting into the magical mood that only the holiday season can bring. This is the time where happiness and peace comes over people like a shroud of bliss, and that white-haired, jolly man with the ability to take his sleigh around the globe gets ready to spark the imagination of millions once again. This is also the time where writers and illustrators come out of the woodwork to present those special stories that end up becoming a part of holiday family traditions. This Christmas tale is one that Noel Claus has kept inside her heart and has now written down so that others can enjoy. She recounts the adventure of Stephen the Snowshoe Hare: how he goes missing and how his friends and family embark through Keepsake Forest to rescue him from Princess Rose…the ruler of Keepsake Castle. Sonny, Stephen’s younger brother, and his best friend, Sammy, need to save Stephen and bring him back home to Freezyville. But in order to get through Keepsake Forest, these young ones need a gift that only Isabella, the Night Time Fairy, can provide. Isabella's gift is a magic dust that allows them to leave Freezyville. The lovely fairy arrives and promises them they will wake on the edge of Reindeer Lake with a boat at their disposal in order to begin their journey. It is Christmas Eve morning and everyone is celebrating the annual Snowfest by listening to the music of Eddie the Elf and the Toymakers. 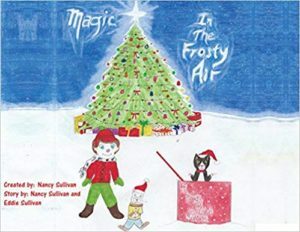 Here, we meet everyone that Freezyville has to offer; from Mayor Finn (a snowy owl originally from Ireland who has been in Freezyville for several years) to Ralphie Reindeer to Jilly Chilly, one of Sammy’s friends who’s worried that she can’t find Sammy anywhere. When the note is found, left behind by Sonny and Sammy stating where they were going and why, Freezyville comes together to help. Everyone is worried and must find a way to bring their boys home. Readers will love not only the town, but also the townspeople and creatures who reside there. In fact, it is a place that’s poorly named, in my opinion, simply because the hearts are so warm there that it seems to me the snow would melt from all the love and devotion they have for one another. (Makes you want to run right out and find its location.) Keepsake Forest is filled with its own fun characters as well, and when Keepsake Castle is discovered and a random act of kindness is delivered, a princess comes into the picture with a backstory that will tug at the heartstrings. The creators of this story have done a lovely job when it comes to storylines and characters. There are those out there who will also like the hand-drawn illustrations. They will bring a smile to the faces of parents who love seeing their children’s artwork, and have children racing around the house looking for crayons so that they, too, can create a story of their very own to share with their friends. But the best part of this “package” is the CD. An audiobook is provided which children will love to hear as they look at the pictures provided in the hard copy format. (The narration helps a great deal, because the hard copy has some flaws when it comes to formatting and punctuation, making it a bit difficult to read.) But slip in that audiobook, have the words “come alive” and you’ll have a great time ushering in the holiday season. Quill says: Make time for this one. There’s definitely magic in the air that will stick throughout the year, making this a new holiday reading tradition.